This mug was produced by Munktiki Imports for Tiki Oasis 17. Glazed in three different colors (brown, beige/light brown, and blue). This is the blue version. 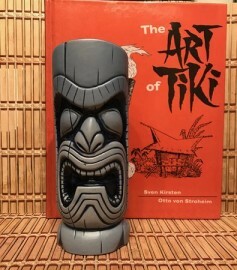 The Tiki design was inspired by a Tiki found at the Hanalei Hotel (as pictured on page 205 of The Book of Tiki). This Tiki is located in the waterfall atrium and was originally from Stephen Crane's The Luau, Beverly Hills, CA.